"Tomato" has one of the highest "glutamic acid" contents so far. For that reason, tomato is probably considered the most widely used vegetable in cooking. In addition, tomato is considered a medicinal food as it contains not only various nutritious elements but also unknown substances that prevent several kinds of bacterial diseases. Glutamic acid can make your brain healthy. It means your brain will have better control of your physical body in preventing bacteria, virus and other sick-producing elements that take over your body. So that's very good, but why tomato was not included in Traditional Chinese Medicine? 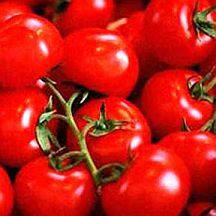 During the ancient time, people thought that tomato was poisonous especially its inner red color part. Today, tomato is always included in our snacks, dinners, and available on every occasion. However, many housewives failed to cook it as a tasty recipe among their delicacies. Most housewives prepare to buy canned tomato sauce, tomato ketchup, tomato paste, tomato juice, etc. in nearby malls. Don't you know that if you know how to cook tomato well, then you may not need to use other seasonings? That's right, tomato itself is as tasty as seasoning. Do you know that there are two kinds of tomato: one that floats on the water, and one that sinks into the water? The tomato that sinks into the water is tastier because it contains more sugar. Do not judge it by color alone. Also, do you know that if you bring a magnet near the tomato, the magnet will repel? It is because tomato is 94% water, and water molecules repel magnetic fields. Now, I will let you know one of the easiest techniques for cooking. At first, peel the tomato skin. Just pass to a hot water swiftly and place the tomato to cold water. It will now be easier to peel off the tomato skin. You can even remove seeds with a tablespoon easily. Now, put the remains of the tomato you are going to cook in a frying pan and simmer it for about 20 minutes until the tomato forms a paste. Isn't that easy? You can place it in a sealable polybag and keep it in the refrigerator for a week or two. For making a tomato juice, mix it with water and sugar or honey and ice. It's a healthy drink, especially during hot summer season. You can mix it with red wine and ice, too. Red wine and tomato are also good in preventing many kinds of cancer. Many health researchers claim that tomato juice mixed with red wine is a cancer medicine. How about breakfast or snack with tomato juice mixed with milk and some fried oats chips in it? It's really a healthy food. You can find various recipes with a homemade tomato paste. The quantity of glutamic acid is about 86 – 140 mg per 100 g of tomato. During harvest, the color and taste of every tomato is different. As we can see, red-colored tomato looks tastier and natural. The sweetness of it can be examined by means of placing tomato in the water as noted previously.